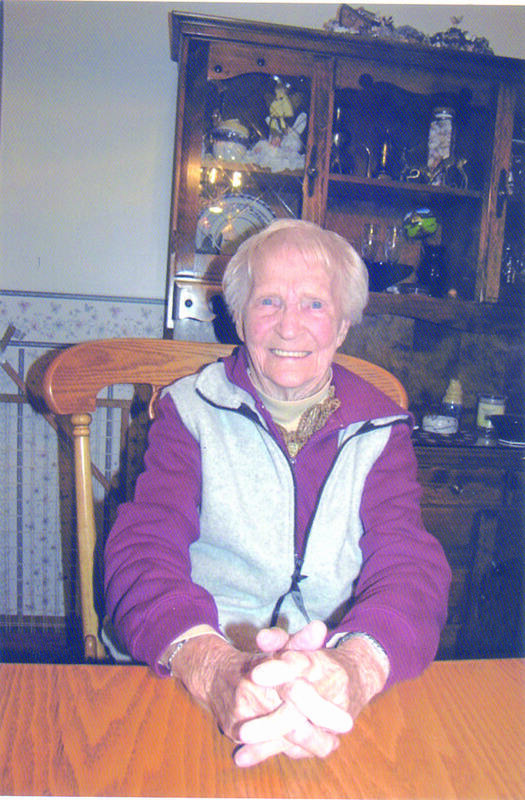 On November 17, Doris Bowen of East Montpelier will turn 100 and join a growing group of centurions that belie not only their age, but also many of the popular stereotypes of older people. “I believe in regular exercise, especially walking, and eating good foods,” says the lifelong Vermonter, who in earlier years would be the first in the family pool in the spring. And in her “retirement years” Doris’ current passions are reading, crocheting, word searches, bird watching and jigsaw puzzles. Amazingly so, her eyesight and hearing are excellent. “She is also still pretty good with a computer,” reports granddaughter, Lisa Pratt. Doris also prefers the nickname “Mam” as given to her by a grandson (Randy) who could not say “gram” explains Lisa. Mam now lives with her granddaughter Lisa and husband Steve Pratt, and their children Tyler, Morgan and Raequel in East Montpelier. “She is a real blessing to our family,” Lisa strongly believes. Mam was the middle child of a large farm family in Rochester, Vermont, and as anyone could imagine, was very active. At age 15, she was a waitress at a local restaurant and enjoyed the exciting news and events of the bustling Rochester. Eventually, she met a boy, Leroy Bowen, and they married and spent the next 15 years farming and raising a family Nancy, David and Ken (the lone survivor today). Also along the way, Leroy worked at Vermont Plywood and then they went on to operate a sawmill on their property. Mam also liked numbers and worked for the hardware store and Rochester Oil Co. doing their bookkeeping for many years. Mam lost Leroy in 1984 at age 75. They spent many winters in Florida, but Mam liked Vermont best. “I really do like the snow and used to get out to enjoy it,” she explains. And, there was family here, including two grandsons, Michael and Randy, who still live in Rochester. “I’ve gotten lazy and have problems with balance,” she admits but with a little help from friends she still does quite well. Mam really enjoys the activities at the Senior Center (Blueberry Hill) for the greater Plainfield/Cabot area.